Blog — WHY? - New album, Moh Lhean, in stores March 3rd, 2017! New Collab Video with Lala Lala +++ Final Alopecia tour starts in 2 weeks! Yoni recently collaborated with Lala Lala on a new song called “Siren 042” the video is out now! Don’t miss your last chance to see Alopecia performed in full. Final dates this month! 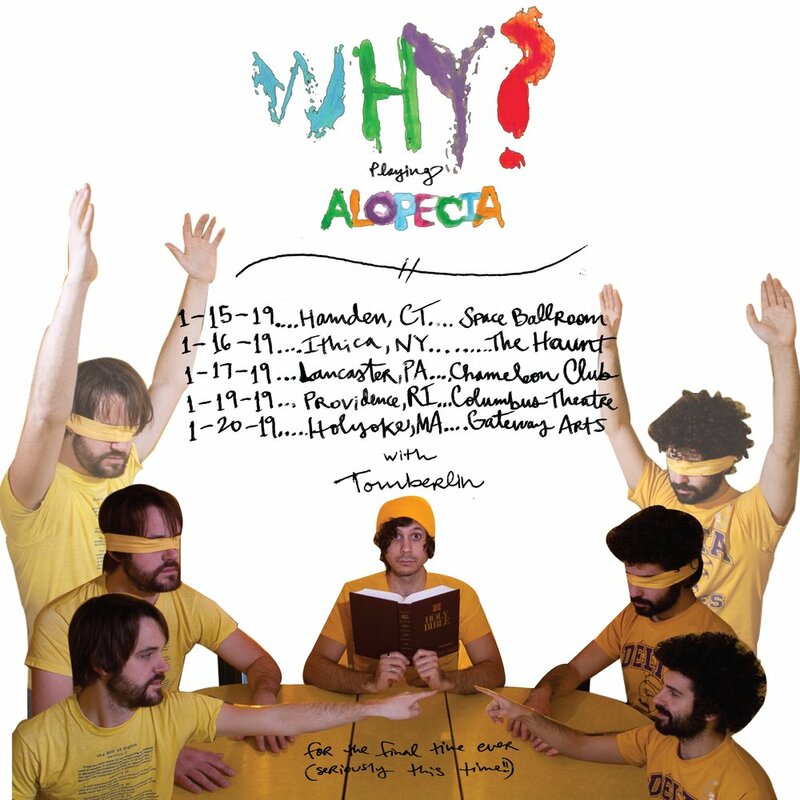 US Alopecia Tour starts in 1 week! SF/LA/NYC already SOLD OUT! Get you tickets quickly before your show sells out too. Chicago and Seattle are next! Here it is! A brand new video by Brain Twins for the Boards of Canada remix of our song, Good Friday. Enjoy! Don't miss us on tour performing Alopecia in full. UK/EU/US watch out! We're so excited to announce our 10-year anniversary reissue of our album, Alopecia! There are a limited amount of translucent cloud white vinyl with an additional translucent red 7" featuring remixes by Boards of Canada and DNTEL. The deluxe edition featuring tri-color vinyl and a bonus vinyl of demos sold out in only 4 HOURS! WOW! If you still want a copy, 500 of them will be distributed to record stores around the world, so make sure to ask them for one! We're also going on a EU/UK tour playing Alopecia in full! Dates below! We've got some awesome new shows coming up! Don't miss out, they'll likely be our last shows of 2017. Watch the new video for our song, "The Barely Blur"
On tour Spring/Summer 2017 in Europe and United Kingdom! Moh Lhean is out and on Spotify now! ALBUM STREAM! Moh Lhean, in full! Woo! Check out our new 360° video for This Ole King! Best viewed in a VR headset, but also really cool on phone/tablet/computer. Google Chrome or YouTube app is required! Video by Scott Fredette, Josiah Wolf, and Yoni Wolf with help from many others. EU Dates added to UK Tour! We're traveling across the pond this spring/summer for the first time in over 4 years! We're bringing our very dear friend, Tall Tall Trees, to open the shows! We're really excited to share "One Mississippi", the 3rd single from our upcoming album, Moh Lhean. Moh Lhean is available on March 3rd, 2017 from Joyful Noise Recordings / Anticon. Just Announced: UK Tour Dates in June! We're really excited to be visiting across the pond to the UK! Stay tuned for more tour dates around the world! Just Announced: Opening Acts for Our Spring 2017 Tour! We're very excited and happy to announce our awesome friends that will be joining us on tour this spring! Make sure you get there early and don't miss eskimeaux, Open Mike Eagle, Rituals of Mine, and Dosh. The Ophelias and molly sullivan open the show in Cincinnati. 3/17: Chicago, IL @ Thalia Hall (tickets) ! 3/18: Minneapolis, MN @ Cedar Cultural Center (tickets) ! 3/19: Omaha, NE @ Reverb Lounge (tickets) ! Don't miss us on tour throughout 2017! Good news Japan! Our new album, Moh Lhean, is being licensed by the awesome label, 7 e.p. We can't wait to make it back there to see you!